The Kentucky Wonder Streamer is a great little lure for taking all kinds of gamefish, especially the Black Basses. 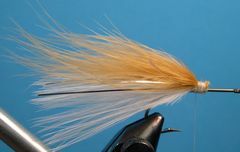 The Kentucky Wonder Streamer is a fairly simple fly to tie. The hardest part may be building and trimming the wool head. 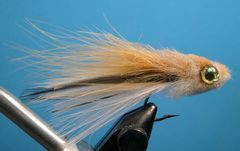 If you haven't made wool heads on flies before, you should check out the Woolhead Muddler for specific instructions on how to make wool heads. Just click on Woolhead Muddler for more information. Be sure to use Marabou blood feathers for the body. Don't use something called "Woolly Bugger Marabou." The feathers outside the Marabou are often referred to as Badger Hackle. In the tying sequence I'm using Variant Herbert Miner Hen Neck feathers but any hen or rooster feather that has the dark stripe would work. If you don't have tan Marabou or Wool for the back and head you could easily substitute gray. 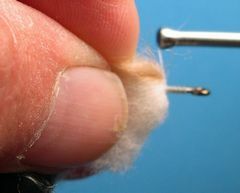 If you would like to learn how I install molded plastic eyes in deer hair or wool heads refer to the "Installing Eyes and Legs" page. I fish the Kentucky Wonder Streamer like any other streamer -- with strips and pauses. I also fish it with a weight-forward line or with a five-foot sinking tip depending on how deep I want it to swim. When the streamer is fished with a weight-forward line, it tracks about a foot or two below the surface. With the sink-tip you can fish it as deep as five to eight feet. Clamp the hook in the vice and crimp the barb. 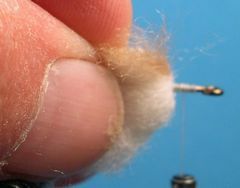 Start the thread exactly 3/16" behind the hook's eye and lay down a thread base from that point back to the hook's bend. If you want to give the Kentucky Wonder more weight now would be the time to add some wraps of.035 lead wire. Make the wraps from the rear of the shank forward to the front of the thread base. Probably about eight wraps. 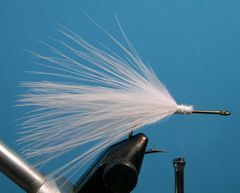 Select a white Marabou feather for the body, remove the tip, and tie it in with the butts of the marabou aligned with the front of the thread base. Note: if you want a larger profile, add a second feather on top of the first. Add four to six strands of Silver Flashabou. 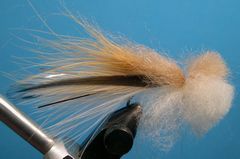 Select a tan Marabou feather for the back, strip half the barbs from the feather and tie them in. Note: You can add the entire feather if you want a larger profile. Select two badger feathers of equal size, one from the right side and one from the left side, from a hen or rooster cape. I prefer hen. 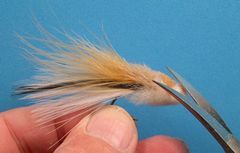 With the cupped side of the feather facing the body, tie in one feather on the far side of the fly and the other feather on the near side. Coat a couple inches of the thread with Zap-A-Gap and bind the feather stem to the existing windings. Move the tying thread down to the bare hook shank and cover it with thread in preparation for tying the wool head. 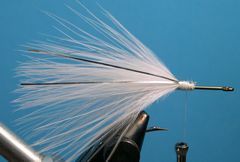 Turn the fly on it's back and tie in a small clump of white wool for the belly. Without moving the thread, turn the fly upright and tie in a small bunch of tan wool for the back. Pull the tying thread through the wool, stroke the wool back with the fingers of your left hand, and take several tight wraps of thread against the base of the wool. Move the thread forward in preparation for tying on the next bunches of wool. Repeat the same process that you followed in steps 8 and 9 by tying in a small bunch of white wool for the belly and a small bunch of tan wool for the back. 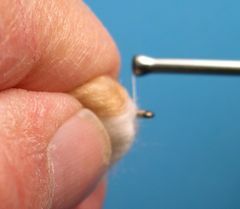 Pull the tying thread through the wool and tie it off as shown with a couple of half-hitches. Trim the wool head to shape with a pair of curved serriated scissors. Burn eye sockets for the plastic eyes with a Burning Point. Clean out the burned hair with a bodkin or toothpick. Add a drop of Dave's Flexament to each eye socket followed by a dollop of Household Goop and pop in the eyes. Your Kentucky Wonder Streamer is ready to take fish.